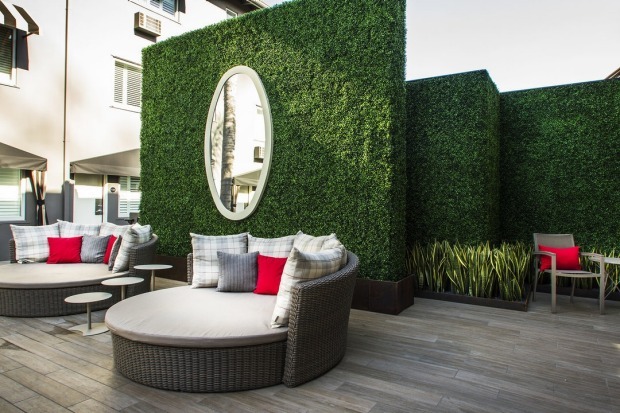 The penthouse terrace at Chateau Marmont, West Hollywood, Los Angeles. 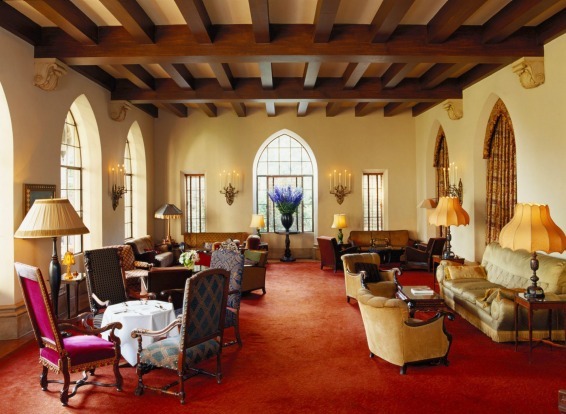 Inside the penthouse at Chateau Marmont, West Hollywood. 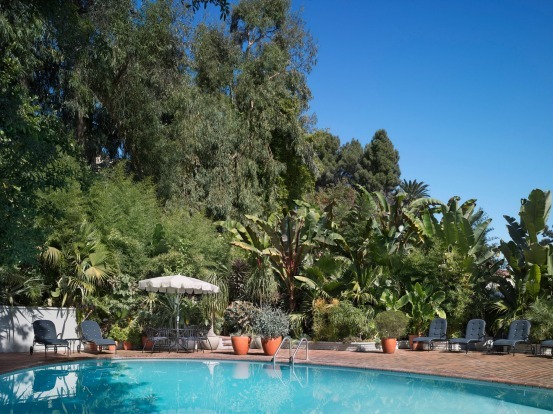 The pool at Chateau Marmont, West Hollywood. 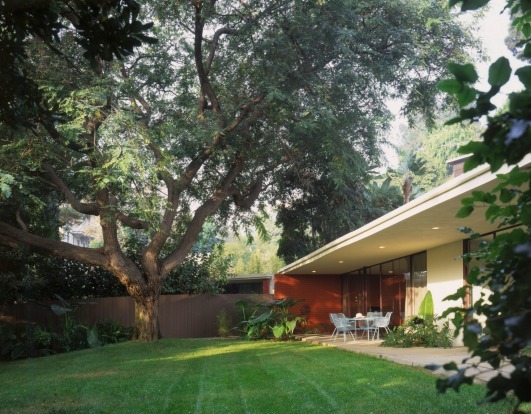 A bungalow with its own yard, Chateau Marmont. 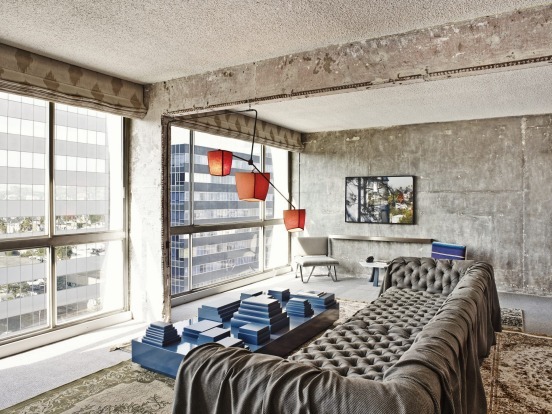 The living area of a bedroom suite at Chateau Marmont. 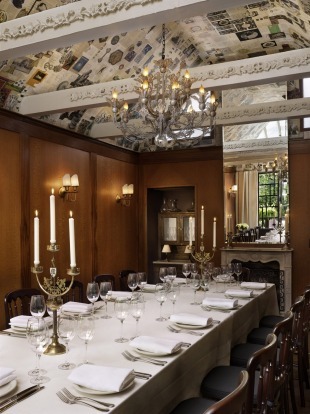 Private dining at Chateau Marmont, West Hollywood. 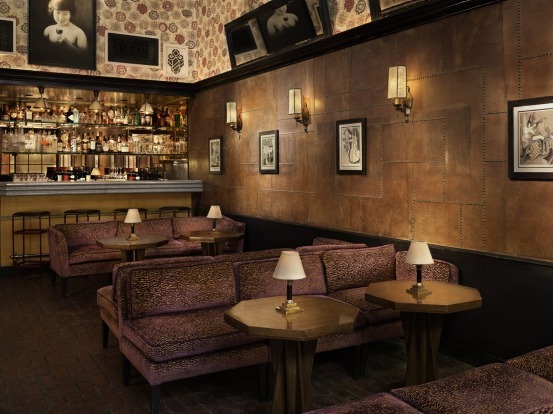 Bar Marmont at the Chateau, West Hollywood. 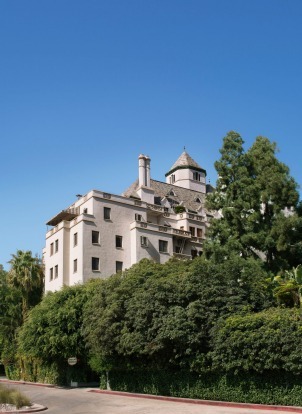 Castle-like Chateau Marmont, West Hollywood. 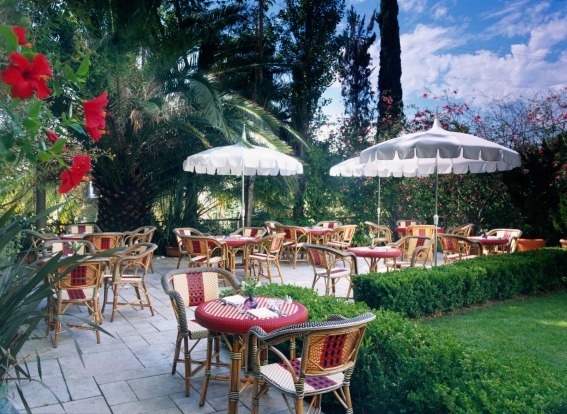 Dining al fresco on the patio at Chateau Marmont, West Hollywood. An image of a crowd at a rock concert adorns the walls of the rooms at Grafton on Sunset, West Hollywood. 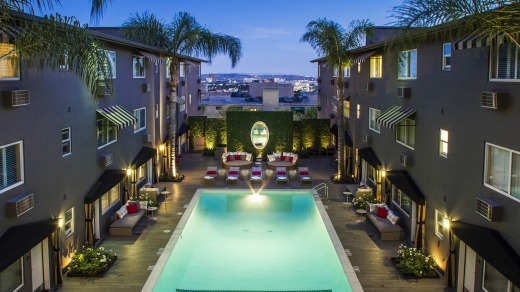 The chlorine-free, saltwater pool at the Grafton on Sunset, West Hollywood. 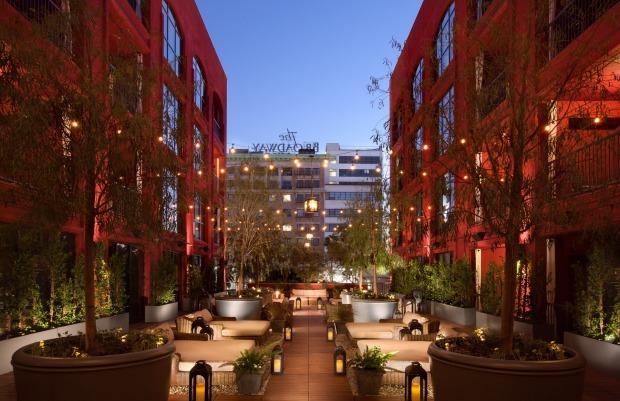 The pool area at the Grafton on Sunset, West Hollywood. 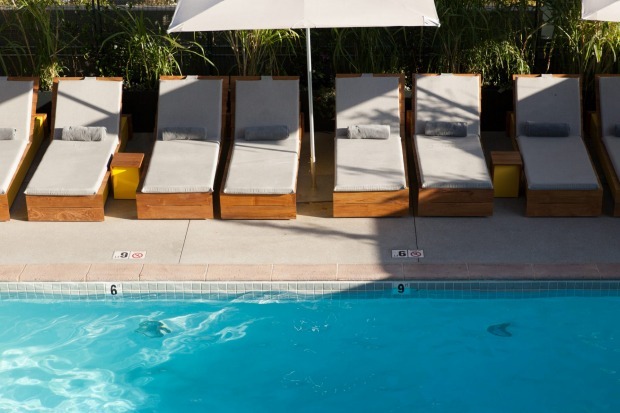 A room with direct access to the pool at the Grafton on Sunset, West Hollywood. 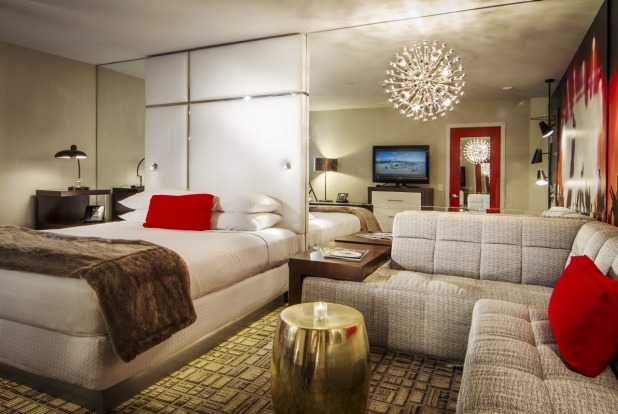 A newly renovated room at the Grafton on Sunset, West Hollywood. Bar, Grafton on Sunset, West Hollywood. 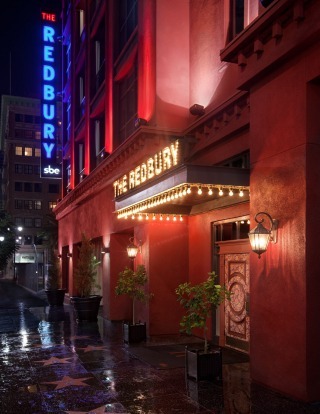 A room at The Redbury, Los Angeles. 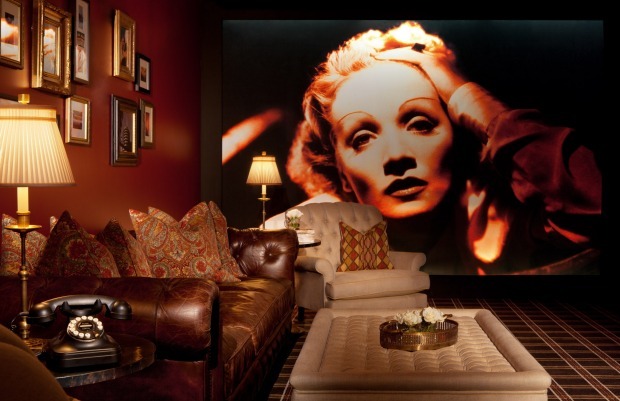 A room at The Redbury, LA. 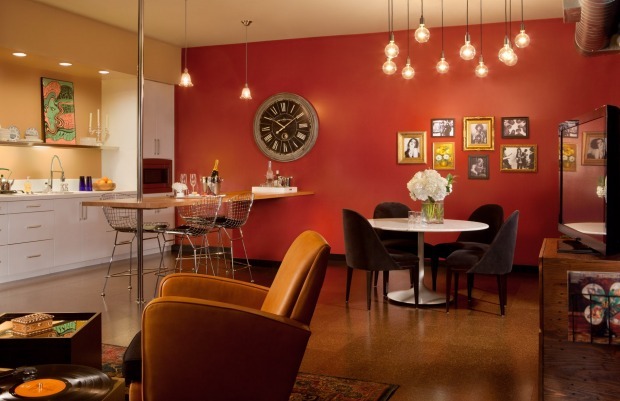 Rooms at The Redbury include a full kitchen. 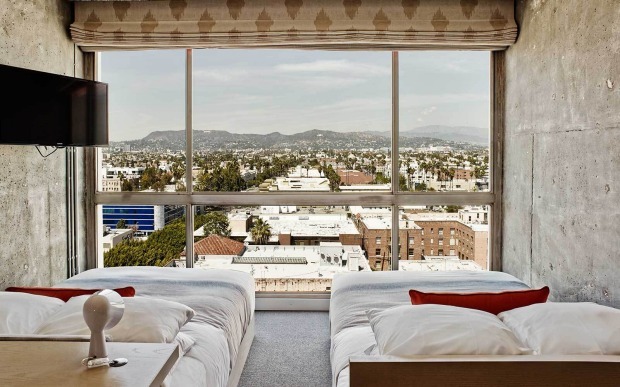 The London hotel, West Hollywood. 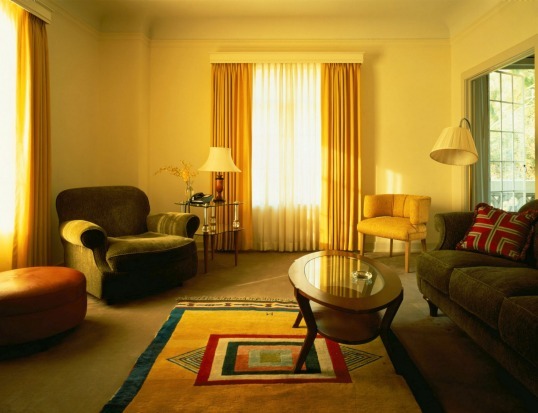 Inside a room at The London hotel, West Hollywood. 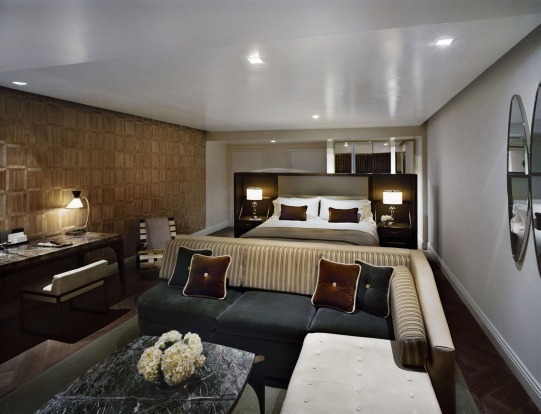 A suite at The London, West Hollywood. 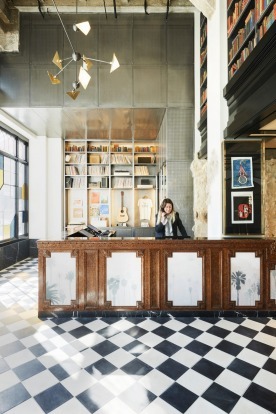 Screaming LA-esque rock'n'roll vibe, this recently renovated boutique hotel is young and wild at heart, and won't burn a hole in your pocket. 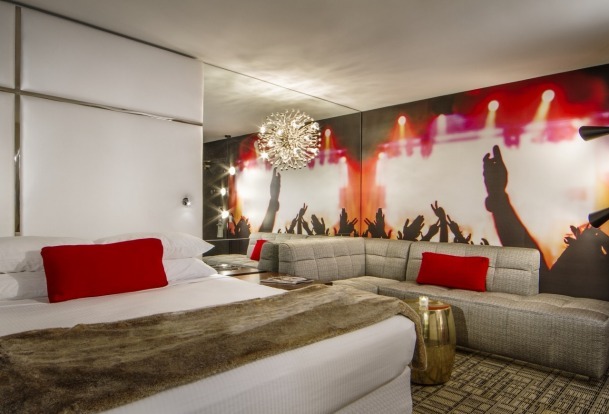 In the heart of WeHo on Sunset Strip, the room walls feature an image of a crowd at a rock concert; funky light fittings throw a spotlight effect across the room and mirrors elongate. Throw in fire-engine red pillows on a comfy L-shaped lounge, flourishes of gold on coffee tables and lampshades and faux-fur throws for the full-throttle effect. 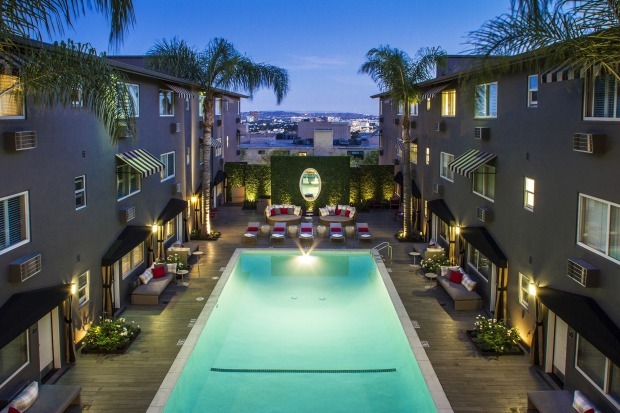 Guests can relax by the chlorine-free saltwater pool before heading to nearby rock icons such as the Whisky-a-Go-Go and the Rainbow Bar & Grill. 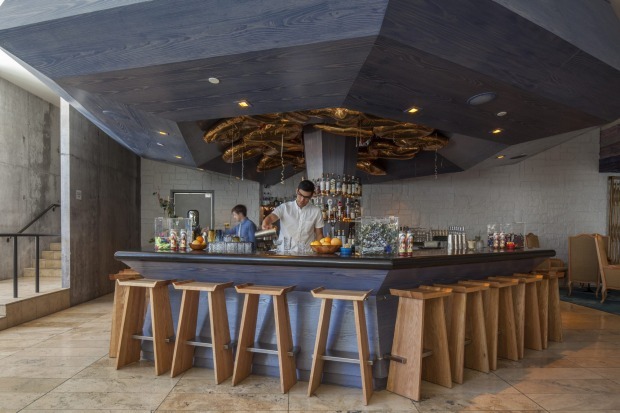 A stellar collaboration with LA chef Roy Choi, The Line gives you little reason to leave the hotel. 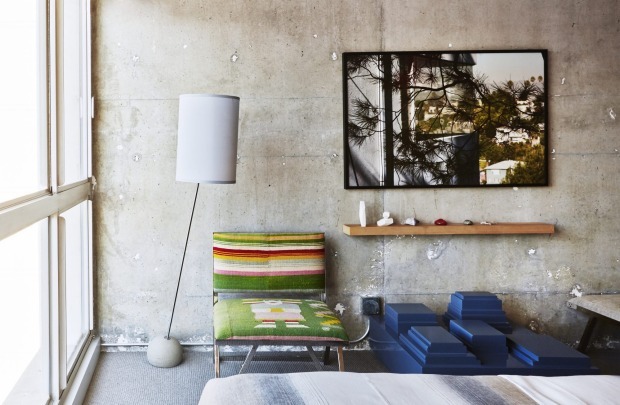 White, bright rooms are industrial chic with splashes of colour on furnishings from a local Venice artist, and offer expansive floor-to-ceiling views towards the Hollywood Hills. 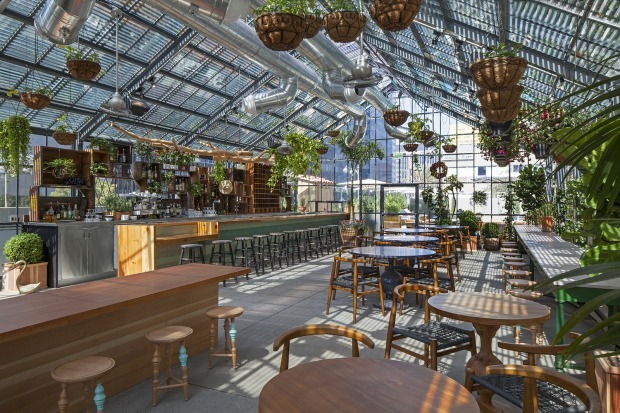 Head to Commissary, the greenhouse restaurant nestled alongside the rooftop pool, sample Korean at Pot and breakfast with delicious baked goods in the cafe. 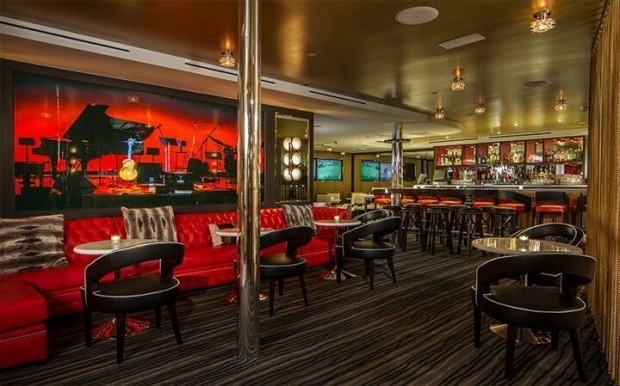 Don't miss '80s-themed bar Break Room 86 – if you can find its secret entrance. 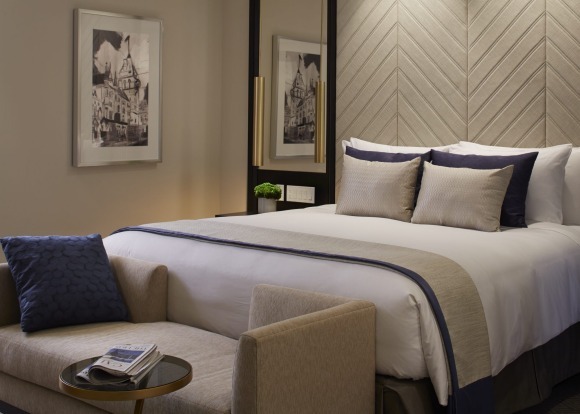 The epitome of understated glamour and style on Sunset Strip, The London is a firm favourite. 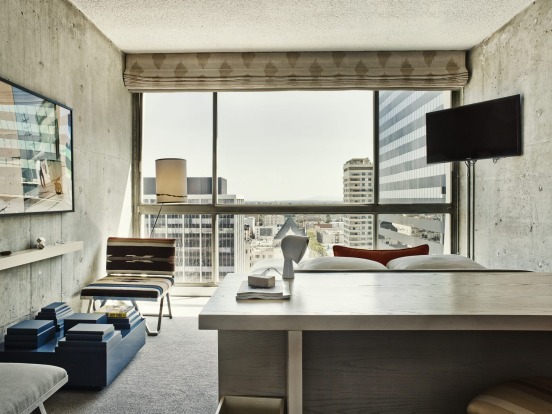 Decadently sized, bright rooms include all mod cons, boasting views of DTLA down to Santa Monica, or Hollywood Hills from the balcony. 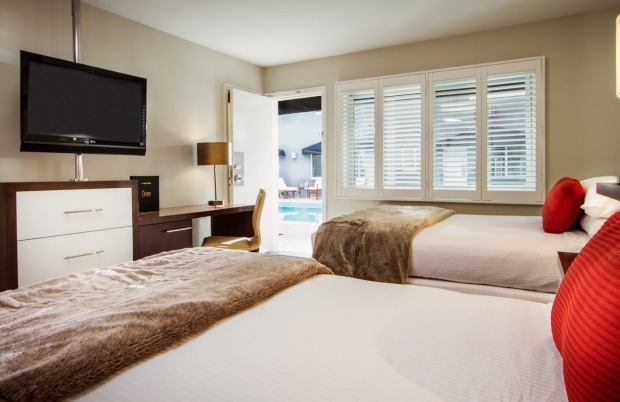 The hotel has outstanding service, including a driver for travel within two kilometres of the property. 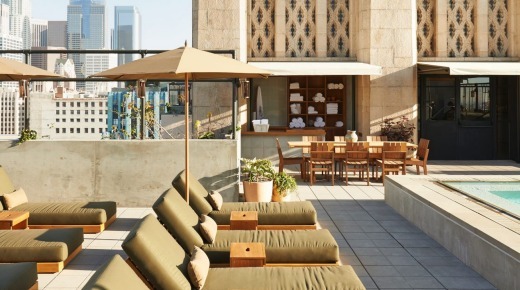 It is also home to one of the best rooftop pools in LA, with 360-degree views of the city, coupled with sensational cocktails from the bar alongside. 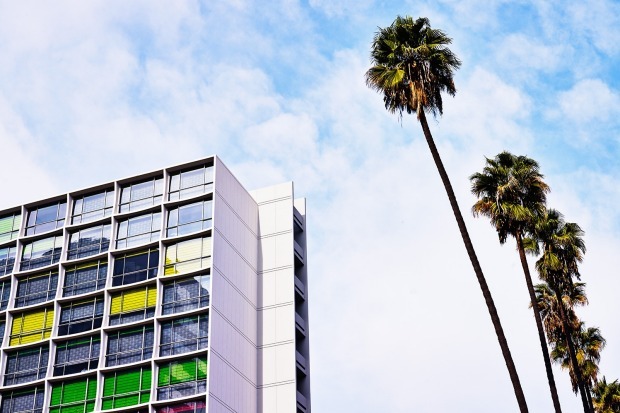 If you can tear yourself away, it is in walking distance of some of the best shopping, bars and restaurants WeHo has to offer. 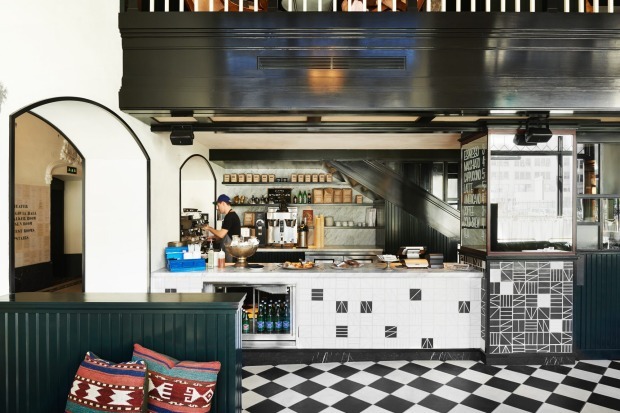 Situated in the historic United Artists building, the Ace shouts hip in an area whose vibe is off the charts, making it an ideal base from which to explore the ever-growing repertoire of restaurants and bars. 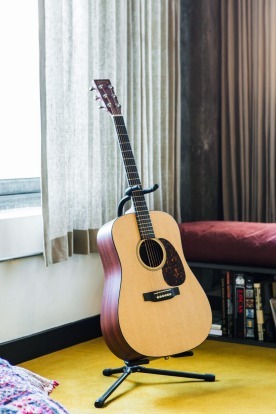 In typical Ace style, rooms are rustic and range from small for individuals to lofts and suites, some of which include unique embellishments such as an acoustic guitar or a turntable with a curated selection of vinyl from Amoeba Music. 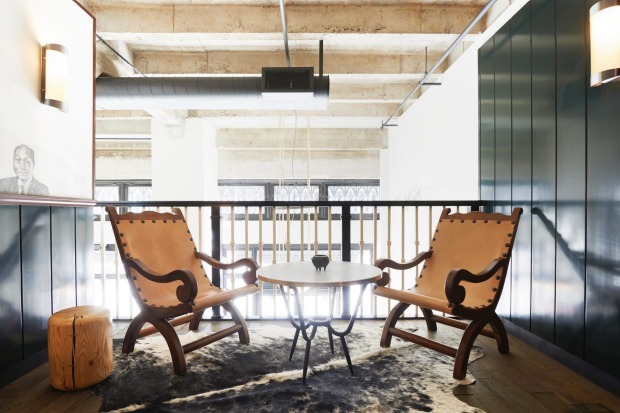 There's public spaces peppered throughout – grab a lounge by the rooftop pool and view the ornate building surrounds or pep up your day with a Stumptown brew from the Coffee Counter in the lobby. 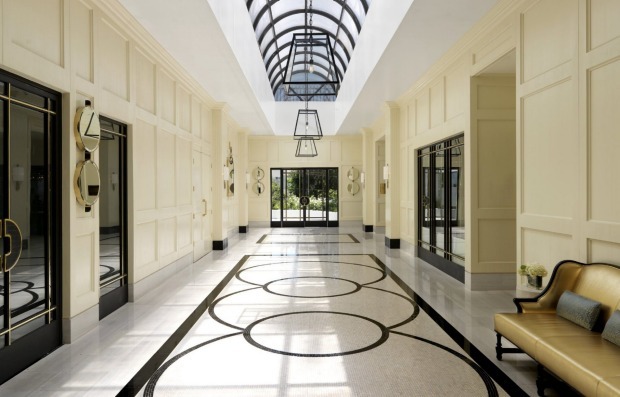 Where Hollywood's rich and famous check in, some never checking out. 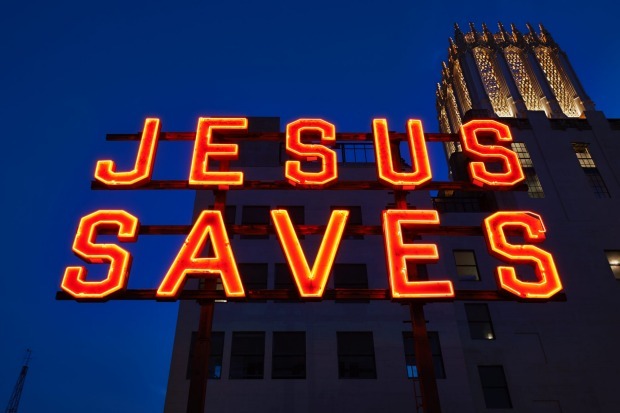 Like its name suggests, the Chateau is a secluded castle in the Hollywood Hills within spitting distance of the throbbing nightlife of the Strip below. 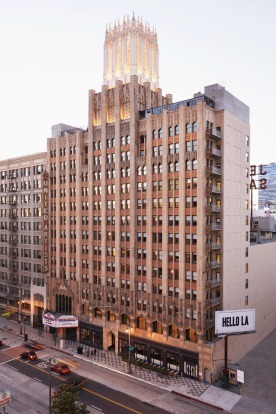 Packed full of rock'n'roll history, anyone can grab a drink at the bar and reminisce about the time Jim Morrison notoriously dangled from a suite balcony. 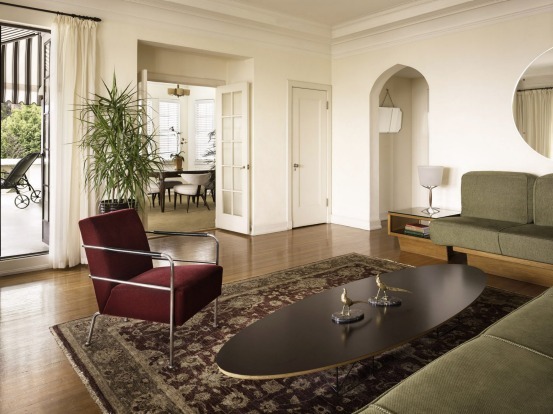 Inside, it's all classic Hollywood mid-century glamour. Large suites can contain formal dining rooms, terraces, private entrances with carports and direct access to the pool via private walled gardens – not to mention thick soundproofed walls and a reputation for hedonism. You'd be forgiven for thinking you'd accidentally stumbled into Hollywood's French bordello. 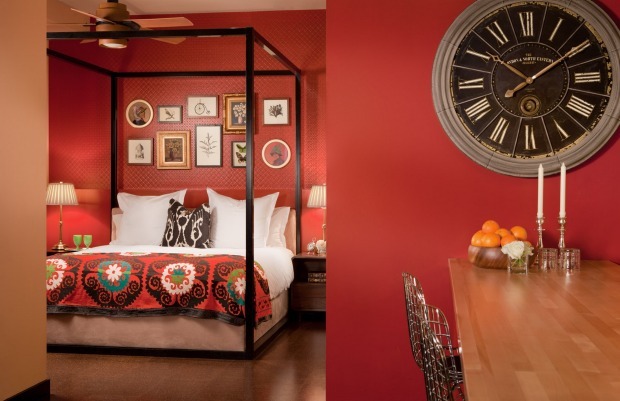 Originally designed for condos, the sizeable, red-walled vintage-bohemian style rooms have been curated by photographer Matthew Rolston and contain unique features such as paisley walls, Persian rugs, couches adorned with lambskin throws and four-poster beds. 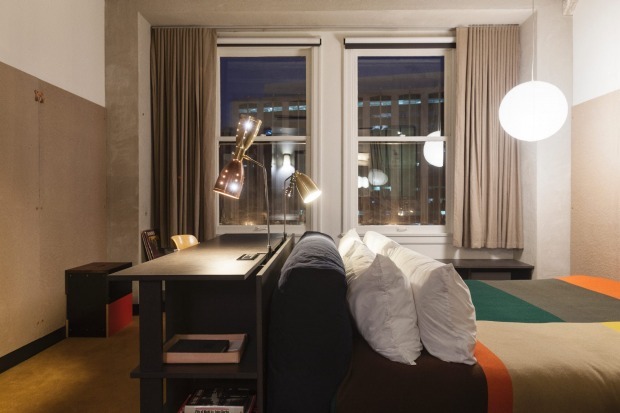 All rooms include a full kitchen, record players with a selection of vinyl and – blissfully – a washer/dryer. 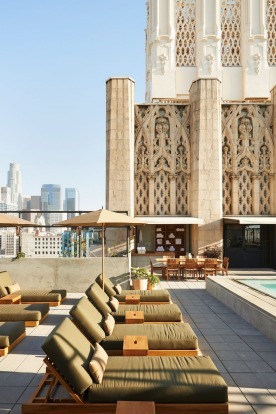 Private balconies offer views of iconic Hollywood sights such as the sign or the neighbouring Capital Records tower, and there's a 24-hour hosting service. Kylie McLaughlin was a guest of Visit West Hollywood at The Grafton on Sunset and The London.